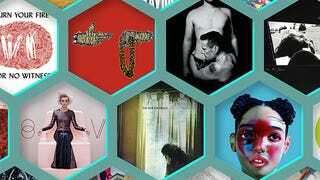 Used to be, you could count on just a few Best Albums of the Year lists to slice through the chaos of the previous 12 months. Pick up a December issue of Rolling Stone or SPIN, clip out your local newspaper critic's personal Top 10, and you had a ready-made guide for how to spend the Best Buy gift cards you got for Christmas. But just as unprecedented access to music online has induced listener paralysis, the crowded internet-rock-critic ecosystem now produces a blizzard of competing lists every holiday season. Triangulating a consensus list now requires trawling through dozens of sites annoyingly fond of slideshows and pagination. So starting last year, I decided to simplify this process through the ancient art of data entry, gathering nearly every staff list I could find into a single Google spreadsheet and using some basic statistics to collate the results. The result, which you can check out here, is a meta-list that's part year-end cheat sheet, part a primitive attempt at music sabermetrics, part a commentary on modern criticism, and part (the biggest part) a music-geek cry for help. With 35 lists touting 588 albums (see the comments below for my methodology), 2014's contest has settled into its final mathematical contours, bringing some shape to a calendar year that was strangely lacking in Big Event Releases. (No new Kanye West album, in other words.) Nevertheless, this year's meta-list gave us late drama in the race for No. 1, encouraging results for gender equality, evidence for the continued existence of geographical differences in taste, and a new/old site for finding the obscure music nobody else is talking about. Part of the fun of keeping this spreadsheet up to date is watching the battle for the top spot play out over the list-crazy month of December. In 2013, there was a fairly exciting two-horse race for first, with Kanye's abrasive Yeezus only pulling away from Vampire Weekend's more subtly bleak Modern Vampires in the City in the last few days. The peloton was far less interesting, with the big-ticket comebacks (Daft Punk, My Bloody Valentine), arena-indie darlings (Arcade Fire, the National), and anointed rookies (HAIM, Disclosure, Chance the Rapper) wanly duking it out for other spots in the Top 10. The common take on 2014 is that there was no obvious, agreed-upon champion, but for most of the month, the spreadsheet said differently. Staked a big lead by the rockist-leaning U.K. mags, the War on Drugs' Lost in the Dream (a shameless '80s Dylan/Springsteen/Knopfler pastiche) looked like it was going to lap the field, before a late surge from English alt-R&B weirdo FKA Twigs made it a contest. In the end, FKA's crossover appeal (no rap- or electronic-focused sites thought much of the War on Drugs, reasonably) gave her full-length debut, LP1, the victory, and art-rock super-weirdo St. Vincent proved broadly fascinating enough to sneak her self-titled fourth album into second place. By the end, it was even a four-way race, with El-P and Killer Mike's Run the Jewels 2—one of the precious few 2014 hip-hop albums everyone could agree on—finishing strong. At least, that's according to the "consensus score," which rewards albums that appear on more lists (see below for a more detailed explanation). If you go by simple average rating, i.e. how high it ranked on the lists it did make, Lost in the Dream takes the trophy, hitting the Top 10 on 19 of the 24 lists it appeared on, versus only 17 of 29 for LP1. Under this system, FKA Twigs didn't even medal among albums that appeared on at least 10 lists, finishing behind Run the Jewels 2 (which suffered from little favor in the U.K.) and St. Vincent as well. Despite the explosion of available outlets, certain grouchy observers maintain that the body of music everyone writes about is growing smaller instead of larger, with the same releases rattling around the online echo chamber. With only two years of data, it's hard to tell if the hive-mind problem is any better or worse than it was in the "good old days," whenever those were. (Robert Christgau's Pazz & Jop archive, which compiles the Village Voice's still-active year-end mega-poll all the way back to the early '70s, is your best bet to find out.) But it does appear that the amount of consensus—as measured by the range of consensus scores—shrank slightly from 2013 to 2014. Last year, the consensus scores of the overall Top 10 ranged from Yeezus at 19.875 to Chance the Rapper's Acid Rap at 44.708 (a spread of 24.833). In 2014, that same range ran from 23.514 to 43.6, a tighter spread of 20.086. The decrease could reflect two things: the lack of a clear winner breaking away from the pack (which is fun), or an increased clustering around the same handful of albums (which is less fun). To look at it another way, 2013's spreadsheet totaled out at 441 albums over 24 lists (an average of 18.375 unique albums per list), as compared with 2014's 588 albums and 35 lists (16.8), a difference that might indicate some increased homogeny. But whatever the hive-mind factor narrowing the top of the list, there's always a broad choice of one-off obscurities to investigate at the bottom. Knock it off with the "Women in Rock!" features, please, but female artists were far more successful this year relative to 2013. Complementing the one-two punch of FKA Twigs and St. Vincent, sad folkies Sharon Van Etten and Angel Olsen both also finished in the top six—which was then followed by a more typical Top 25 sausage party interrupted only by the fun trio of Lana Del Ray, Taylor Swift, and drone-rock specialist Grouper (plus Against Me!, if you prefer to shatter the gender binary). After a 2013 that saw only the sisters of HAIM and individual members of the Knife, My Bloody Valentine, and Arcade Fire representing women in the top ten, this was a modest improvement. Most publications keep to pre-internet schedules and have their lists more or less finalized by Thanksgiving; for the second year running, the flaw in that strategy was exposed when D'Angelo "pulled a Beyoncé," surprise-releasing his long-awaited Black Messiah on December 15 after more than two-thirds of this year's lists were already posted and most of the other staff polls were already tallied. Turns out there are advantages to procrastination, as four of the last five lists posted were able to squeeze Black Messiah in, enough to raise it up to No. 77 overall within a week of its release. Had he shown up a month earlier, I'm guessing D'Angelo would've breezed to the top spot. But given that he waited 15 years to release a follow-up to Voodoo, he can probably handle waiting until next year's contest, which may belatedly acknowledge his cultural impact on 2015 just as a handful of this year's lists smartly recognized Beyoncé's heavy footprint on 2014—almost enough to "illegally" sneak her self-titled late-2013 juggernaut into the Top 100. A U R O R A (no. 64). You might think that the music industry's relocation to the internet would've smoothed out differences of opinion across the Atlantic. But you'd be wrong. Splitting this year's list into 24 U.S.-based publications and 10 U.K.-based operations (Australia's Faster Louder is the odd man out) gives us two different champions: Run the Jewels finally gets a trophy as the U.S. champ, while FKA Twigs wears the U.K. crown. Comparing the two Top 10s is also interesting, with only five shared entries: War on Drugs, FKA Twigs, St. Vincent, Sharon Van Etten, and electronic-music deity Aphex Twin. The differences might say something about the respective genres that dominate the music media on both sides of the pond, with the U.S. going for more indie and hip-hop (RTJ, Spoon, Perfume Genius, Flying Lotus, Angel Olsen), and the U.K. preferring the electronic (Caribou, the Bug), the unsettling (Swans, Sleaford Mods), and, per Baltimore's own Future Islands … emphatic dancing? If nothing else, this split suggests that FKA Twigs should book an English tour as soon as possible—her massive U.K.-only lead over silver medalist Sharon Van Etten was absolutely critical to her victory on the overall meta-list. Probably the funniest—if most predictable—individual No. 1 pick of the season was Rolling Stone's coronation of U2's iTunes annoyance Songs of Innocence. Only two other publications, grandfatherly U.K. bibles Q and Mojo, bothered to list the record, and even those classic rock fetishists could only muster up enough enthusiasm to put it at No. 44 and No. 33, respectively. But the rest of Rolling Stone's list holds comedic treasures as well, including a No. 2 record (Bruce Springsteen's High Hopes) which appears on exactly zero other lists, instantly forgotten releases from Foo Fighters and Weezer in the teens, and the only votes for a bunch of people you probably didn't even realize or already forgot put out an album in 2014: Jackson Browne, Lenny Kravitz, Sean Lennon's Ghost of a Sabertooth Tiger, and Coldplay. In fact, if you calculate a "hive-mind score" (scroll down) for each publication, Rolling Stone falls on the more esoteric half of the list at No. 19, suggesting that the magazine has come full circle to once again cover the underground and (at least, critically) obscure. Even in an overcrowded music-critic ecosystem, the out-of-left-field recommendations can come from the most unlikely of places. But in this case, no need to waste a Best Buy gift card to check out that "underrated" U2 record: You already own it. Rob Mitchum is a music and science writer, mostly for Pitchfork and the University of Chicago. He lives in Oak Park, Ill., and tweets at @robmitchum (and @phishcrit, if you're into that sort of thing).